Having Russell Ingall step in to lend a hand during the Nissan Motorsport test day proved a worthwhile exercise, according to Todd Kelly. The Nissan co-owner and driver detailed a positive test day for the group at Winton in perfect conditions today, with Kelly’s new-for-2016 co-driver Matt Campbell sharing the carsales Nissan and Ingall sharing brother Rick’s Sengled Altima. 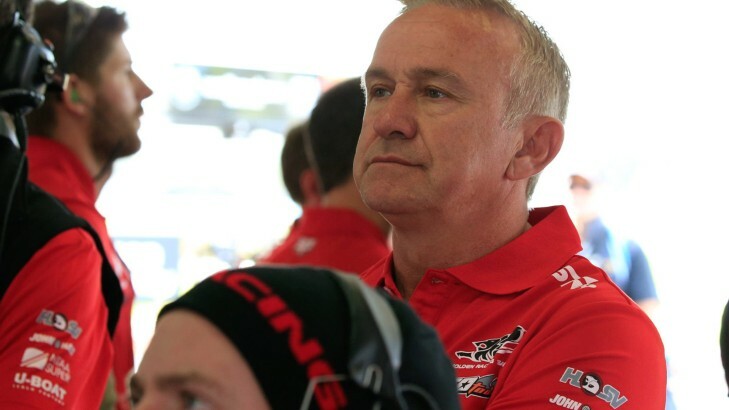 Though ‘The Enforcer’ drove other front-running cars during last year’s Pirtek Enduro Cup, Kelly said Ingall provided plenty of worthwhile feedback without giving away anyone else’s secrets. “We’ve raced against him our whole careers and rubbed wheels,” Todd said. “There’s a lot of people who have had good experiences and bad experiences with other drivers in the category over the years – Russell is one of those guys Rick and I have always had respect for and have never had any run-ins on the track. “We’ve always had quite a good relationship with him, so it’s pretty handy to have a guy like that to have to a test day, jump in the car and have a bit of fun. Kelly wouldn’t say whether Ingall was in-line for a co-drive – “you’ll have to ask Rick!” – but was pleased with the progress the four-car group made on the recently resurfaced circuit today. “It’s a little bit hard when the track is so good because we race on a lot of circuits that are extremely low grip, which produce specific problems normally with the cars – it’s hard to replicate and then be able to test things and fix that,” he said. Even a little bingle for Rick’s car, hitting the wall near the end of the day didn’t prove too big an issue. “We had a bit of a problem with the steering in his car, which was right at the worst possible moment … it was quite frustrating, because it could’ve happened anywhere on track. Another team running a special guest was Preston Hire Racing, with six-time champ Jamie Whincup and engineer David Cauchi down for the day to help provide direction on the Triple Eight car. It was a boost for driver Lee Holdsworth, whose feedback lined up with Whincup’s and feels he will now be in a better position for the next round in Perth, as well as the upcoming Winton event. “Very pleased with the day – we made good progress with the car, certainly learned a couple of things and it was good to have Jamie and Cauchi come down,” Holdsworth said. “Karl [Reindler, co-driver] was out there for a few laps, but unfortunately he didn’t get many because we broke a header at the end of the day and that sort of ended our day … we had dramas before he jumped in so he only got four or five laps. But Jamie and I got plenty and we’ve definitely made in-roads on our setup. Wilson Security GRM hit the track off the back of its Phillip Island victories, and team boss Garry Rogers believed it was a productive day and reported no bingles or issues. Championship drivers Scott McLaughlin and James Moffat did not share their cars, he said – they were focused on other things than co-driver miles. “We went there to try … a few mechanical bits and pieces to the cars, both our Dunlop Series and main series cars, and that’s what we did,” Rogers said. “We were happy enough with the end result that came out of it all – I know that’s a bit grey, but really that’s about what it is. The Holden Racing Team also tested with its co-drivers, but did not wish to provide any further comment about the day.